The ME ME ME Retreat: A yoga holiday that’s all about YOU. Arrive Monday 5th August and depart Saturday 10th August. What would your perfect yoga holiday look like? Is it somewhere beautiful? What would your perfect yoga holiday feel like? Do you get to the end of each day with a stretched and soothed body, sun-kissed skin, and a belly full of delicious food? What would your perfect holiday sound like? Birdsong in the morning? The splashing of the pool in the afternoon? The popping of a wine bottle cork in the evening? Chirping of crickets during bedtime meditation? You don’t need to imagine. It’s real…. Flex that imagination muscle once more, lovely human. We’re diving in to a typical day…. You wake to the gentle sound of birdsong. 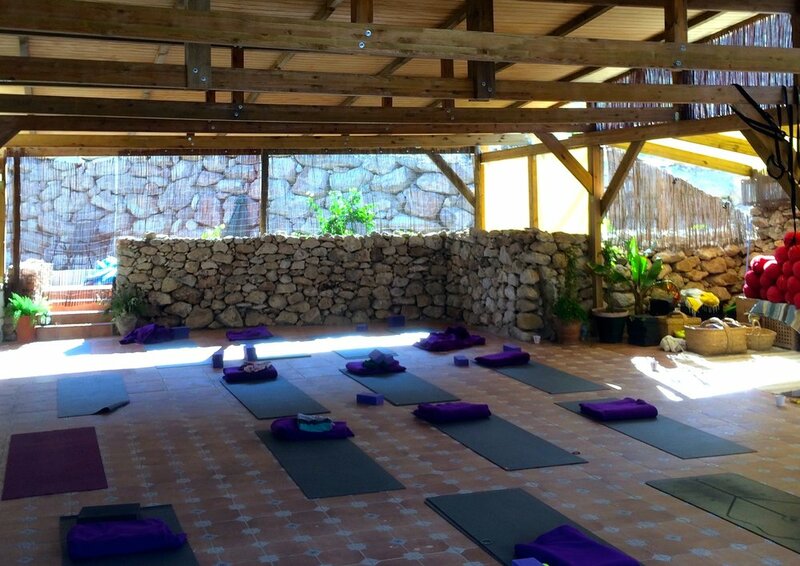 Sliding out of your comfortable bed, you pull on your yoga clothes and walk to the shala pausing to take in the morning light shining onto the hills of the Cabo de Gata – one of Europe’s most beautiful natural parks; an extraordinary landscape of volcanic rock foundations, flora and fauna. For 75 minutes you breathe, move, flow and get connected to body and breath. As the sun begins to warm the world, a gentle breeze blows through the al fresco space and it seems being surrounded by nature makes savasana even sweeter. It could seem decadent to have three helpings of breakfast but the porridge is perfectly spiced, the fresh bread still warm from the oven, and when the tomatoes are so delicious it’s only right to accompany them with a hefty slice of local cheese. Your only concern is what to do with the rest of your day. Take a dip in one of the eco-pools? Read your book in the luxurious living room? Should you take a stroll through the hills? Will you spend the afternoon snoozing or exploring the village just down the road? Before the day winds down, you join your fellow students for a 90-minute yoga session delving deeper into your practice. Perhaps the focus will be to develop inner and outer strength, or an exploration of how we can be open-hearted in our asana practice and courageous in our life. Making your way to the main house, you can smell the aromas of another delicious home-cooked vegetarian dinner. Will it be the tastiest curry outside of India? Or a nut roast with the crispiest potatoes you’ve ever tasted? And chocolate cake for pudding? As you share a bottle of red with your fellow retreaters you swap stories and share laughs. After rounding off the day with a few peaceful moments of mindfulness you stroll back to your waiting bed. You gaze up at the sky full of stars, and wonder how on earth you’ll cope with doing it all again tomorrow. 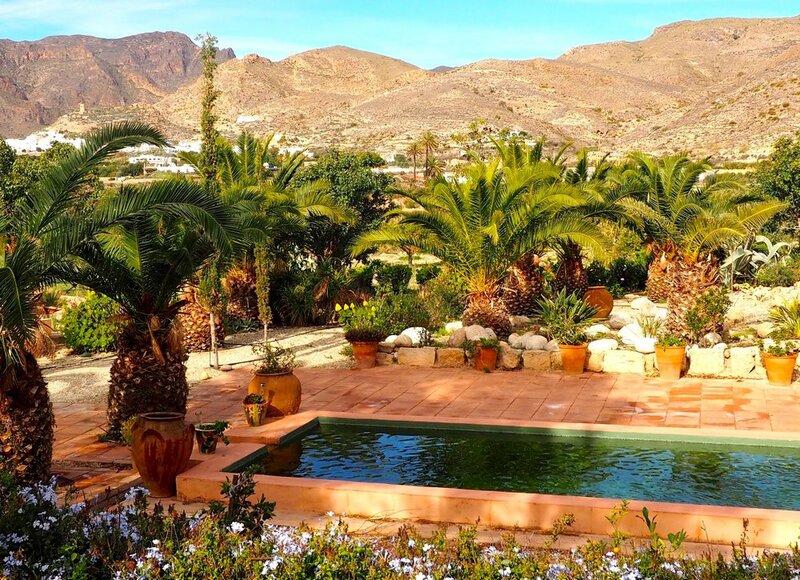 Our home for the week consists of the ‘finca’, the main house which has won awards for its striking design, and a group of charming, converted traditional buildings called the ‘cortijos’. The house was (and sometimes still is) a family home which means it’s oozing with character. Each and every space has its own personality. This is definitely not a hotel – it’s so much more. It’s a real, lived-in, quirky, perfectly imperfect space that magically makes you feel like you’ve come home too. And it’s not just the humans who bring the place to life. You may meet a gecko on mosquito-patrol in your bedroom, a kitten chasing shadows across the courtyard, or one of the dogs soaking up the sun in a flowerbed siesta. All the bedrooms are ensuite and two double rooms are available for single occupancy, so if you want to sleep like starfish, run around in your birthday suit, and have a wee with the bathroom door open, you may want to snap one of these up quickly! All the other rooms are twin. Every room has air conditioning. Meals are delicious vegetarian buffets created with fresh local produce by our very own team of absolutely awesome cooks. The food is unbelievably tasty, healthy and varied, so you’ll be sure to have your tasted buds delighted just as much as all your other senses. You’ll get three gorgeous meals every day (breakfast, lunch and dinner). Should you need anything between meals (you won't!) there will be plenty of mouth-watering fresh fruit. Should you fancy a tipple in the evening, beer and wine will be available. You can make yourself a hot beverage whenever the mood takes you (although hopefully the weather will be so warm that even the most committed tea-drinker will think twice before cracking open the Earl Grey) and there’s always fresh naturally filtered water to quench your thirst. Pre-bedtime meditation session every night. Pardon the pun but I know that being flexible is helpful, and I appreciate that most of us don’t have £775 lying around to fling at a yoga teacher. So for a strictly limited period I’m offering a flexible payment option. You pay 50% now, and the other 50% by 1st April 2019. Yes, there are some good ole’ terms and conditions but my hope is that it makes it easier for YOU to come and join us at this very special gathering of awesome people. Click here to read all the information about how it works, then email Meg if you’d like to book. Still not convinced? Have a little look through our very special photo album from the Me Me Me Retreat 2018…..
One more time – can you imagine how good it’ll feel to finally have time. JUST. FOR.YOU? You're right! This will be amazing. I need to book now!